Fresh out of Jerusalem, Rav Isaac and Tal Attia arrived at Brandeis University in the summer of 2017. 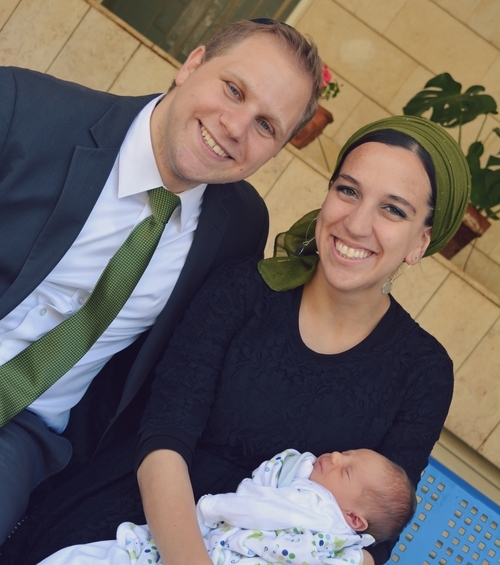 Along with their newborn son Abie, they are ecstatic about the opportunity to learn and partner with students to develop a meaningful, fun, and dynamic Jewish life on campus! Rav Isaac Attia was born and raised in sunny San Diego, CA. He studied for two years at Torat Shraga before attending Yeshiva University. While there, he received his BA in Psychology and Business Administration and served as President of the Yeshiva Student Council (SOY). After marrying his best friend and moving to Israel, Rav Isaac pursued semikha at the Rabbi Isaac Elchanan Theological Seminary Israel Kollel (Gruss). In his summers, he served as program rabbi for Center for the Jewish Future’s (CJF) Counterpoint Israel and the Bar Ilan Summer Research Program, and in this last year, he taught at Yeshivat Orayta. A proud Sephardi, Rav Isaac is tri-lingual (English, Hebrew and Spanish! ), enjoys a good harmony and is always down for a competitive game of football. When he is not hitting the sefarim, he can be found scouring Udemy for all things interesting, having a philosophical conversation with friends, or experimenting with wacky smoothie flavors. Isaac has a passion for Jewish education, along with a keen interest in psychology and entrepreneurship. He hopes to combine these interests in his position as JLIC rabbi at Brandeis and in his service to the Jewish community at large. Tal Attia is from Elizabeth, NJ. She spent a year at Michlelet Mevaseret Yerushalayim (MMY MMY!) and then went on to study at Stern College for Women, where she received her BA in Psychology. Straight out of college, Tal pursued her MA in Nonprofit Management & Leadership at Hebrew University’s Rothberg International School. She has since worked for Ayeka Center for Soulful Education as a Development Associate, and MMY as an Activities Coordinator/ Guidance Counselor (Rakezet). She has also served as Program Coordinator for multiple programs, including Counterpoint Israel and the Run4Afikim for Israeli youth at risk, the Bar Ilan Summer Research Program, and Yeshiva University’s Midrashia, which partners with Machon Puah to provide kallah teacher courses for rebbetzins-in-training. Tal is the proud mother of Abie, is an avid reader, enjoys nature hikes, and plans to pursue a further degrees in Psychology/Family Counseling in the long run.